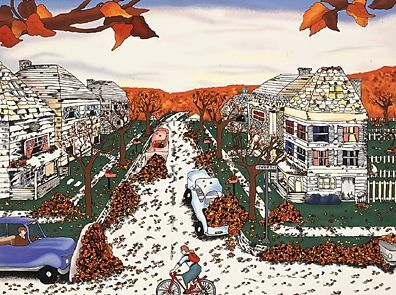 Home | Serigraphs and Giclee Fine Art | Linnea Pergola | Linnea Pergola Limited Edition Serigraph on Paper: " Center Avenue in Fall "
Linnea Pergola Limited Edition Serigraph on Paper: " Center Avenue in Fall "
Image Size: 22" x 26"
About the Art: Linnea Pergola's desire to express her unique creativity is the driving force which inspires and guides her to meld the diverse elements of drama and naive charm is her multi-media paintings and serigraphs. Pergola's body of work is a collection of captivating and enchanting portrayals of life infused with fantasy to reveal the artist's pure and unaffected response to her subject. Pergola admires the colors and moods of Georgia O'Keefe, the strong illustrations of N.C. Wyeth and the gentle scenes of Swedish life by Carl Larson, but credits only one person as an artistic influence. A long ago instructor encouraged Pergola to experiment with new mediums and techniques and introduced her to the intricacy and contrasts that can be achieved through the mastery of pen and ink. Finding this exacting and difficult medium rewarding. Pergola utilized its distinctive characteristics to compose the singular style of her art. Once a subject inspires Pergola, it is transformed by the artist into a new reality. Often the image is changed before the very first line is placed upon the canvas or paper, while other times the image gradually changes as the artist interacts with the image. To begin, Pergola creates a detailed drawing with pen and black India Ink. The artist then gives a stronger sense of depth to the scene by adding gray shadows with a brush and diluted black India ink. All the while, Pergola must anticipate the visual effect of every pen and brush stroke-India ink is a very unforgiving medium. Oil paint is used to give additional detail and visual excitement by coloring some or all of the empty areas of canvas or paper. When using color in selected areas only, Pergola focuses the viewer's attention on the individual elements she feels are most significant within the overall image. Home | Fine Art Prints & Limited Editions | Gallery Direct Art is your Authorized Chalk & Vermilion Dealer | Linnea Pergola | Linnea Pergola Limited Edition Serigraph on Paper: " Center Avenue in Fall "